Trump has called for all NATO allies to increase their defence budgets to two per cent of their GDP. Prime Minister Justin Trudeau, Defence Minister Harjit Sajjan and Foreign Minister Chrystia Freeland hold a news conference after participating in the NATO Summit in Brussels, Belgium on July 12, 2018. BRUSSELS — Donald Trump boasted Thursday of singlehandedly winning commitments from his fellow NATO leaders to meet and exceed a defence spending target of two per cent of GDP — even though Prime Minister Justin Trudeau spoke only of continuing with Canada's existing military plan. At a news conference wrapping up the two-day NATO summit in Brussels, Trudeau was pressed to provide more details about the U.S. president's sudden insistence that allies have agreed to spend more — and to do it more quickly. Trudeau said he did agree to uphold Canada's commitment to the 2014 Wales NATO summit pledge on defence investment, but took pains to point out the declaration technically states NATO allies would merely "aim to move towards'' the two per cent guideline within a decade. "That is something we certainly agree with,'' Trudeau told a news conference. "Leading up to 2014 and the Wales conference, NATO countries had been under-investing in their military and declining in their military and defence investments — including, unfortunately, in Canada. During his own news conference Thursday, Trump was asked how he would increase pressure on Canada, Germany and Italy if any of the three failed to meet the two per cent target. Trudeau was not the only leader who seemed at odds with Trump's understanding of what emerged from an emergency meeting of NATO leaders that derailed the final sessions of the summit's closing day and set off another firestorm of controversy with the U.S. president at its centre. French President Emmanuel Macron quickly disputed Trump's claim that NATO allies had agreed to boost defence spending beyond the two per cent benchmark, citing the group's communique that lays out the original goal. French President Emmanuel Macron addresses a press conference on the second day of the NATO summit in Brussels, Belgium, on July 12, 2018. "It confirms the goal of 2 per cent by 2024. That's all,'' said Macron, who also denied talk of Trump threatening to withdraw from the alliance. Trudeau touted his government's long-awaited defence policy review, released last June, as the answer to Trump's latest demands for more spending from NATO allies. And he said Canada has promised to reverse a decline in military resources with an eye towards the two per cent target. Justin Trudeau is welcomed by NATO Secretary-General Jens Stoltenberg at the start of a NATO summit at the Alliance's headquarters in Brussels, Belgium on July 11, 2018. Including that commitment, however, Canada's current defence spending plans are only expected to bring it to 1.4 per cent of GDP by 2024 — well short of the Wales target. "You know, the two per cent was a range, a goal, it wasn't something they were committed to. Now it's a commitment. That's a big difference,'' Trump said. Canada was never expected to agree to Trump's spending demands. Instead, Trudeau's announcement prior to the summit — plans to lead a new training mission in Iraq and an extension on its role with a NATO battle group in Latvia through 2023 — were aimed at demonstrating a commitment beyond mere dollars. Justin Trudeau speaks with Spanish soldiers as he visits Canadian-led battlegroup troops at the Adazi military base in Latvia on July 10, 2018. While in Latvia earlier this week, when asked about plans to meet the target, the prime minister made it clear he had no plans to double Canada's defence budget. Following Thursday's emergency session of NATO members, Trump declared the military alliance to be "very unified, very strong, no problem.'' He said he successfully pushed for NATO members to spend more of their budgets on defence and at a faster pace than expected. "We have a very powerful, very strong NATO, much stronger than it was two days ago,'' Trump said at his closing news conference, citing Secretary General Jens Stoltenberg as crediting the U.S. approach for the progress. U.S. President Donald Trump he holds a news conference after participating in the NATO Summit in Brussels, Belgium on July 12, 2018. The summit's dramatic, chaotic conclusion — complete with the U.S. president suddenly making demands following a formal communique — bore a striking similarity to Trump's departure from last month's G7 meetings in Quebec. There, while on board Air Force 1, he used his Twitter feed to rescind his support of a joint communique and slam Trudeau personally after hearing the prime minister repeat Canada's insistence it would defend itself from U.S. aggression on trade. 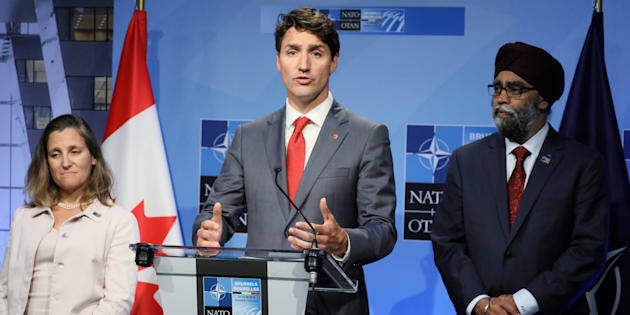 Trudeau chose his words more carefully this time around, although he did acknowledge that everyone knew going in that the president wanted his fellow NATO members to carry more of the financial burden. Justin Trudeau gives a closing press conference during the NATO summit in Brussels, Belgium on July 12, 2018. "The president has been consistent. There was no surprise in his approach on this,'' Trudeau said, adding that all NATO leaders were ready to demonstrate and reaffirm their commitment. But they also wanted to ensure they pointed out that dollars-and-cents commitments aren't the only ones that count.